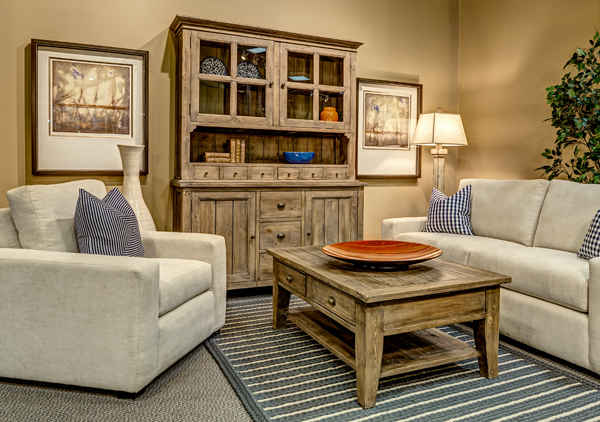 This retail setting was created to represent a more casual living room with nautical navys, creams, browns and oranges. This contemporary furniture could be used in so many different styles of rooms. It has clean lines, yet because of the plush cushion construction and the scale of the frame, is not an limited to use in modern rooms. We have used rustic drift wood case goods as well as the gingham throw pillow fabric to create that warm feeling of this being a cottage or country living room. This setting is a great example of how you can update a country look by incorporating more modern lined furniture and abstracted artwork.